Seems like my jade plant is on Steroid. She keeps on growing. I am 5’11″” tall and a big dude. You can see the the width of the jade is huge and it is tall. Care: Water once a week in Summer and once every 2 weeks in Winter. Use good clean fertilizer . Lots of TLC….and lots of good loving talking. 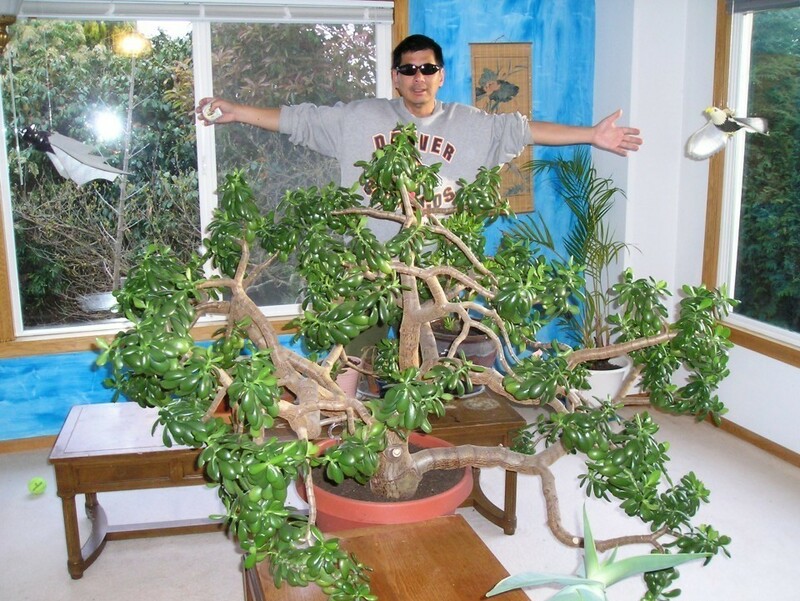 This entry was posted in largest Jade and tagged largest jade plant on May 6, 2011 by chrisgoh1. I hope you can help me. I have 2 jade plants, both have the same problem. Leaves from bottom of the stem start to get brown, shrinke and then fall. New leaves keep growing from top of the stems, they look healthy at the beginning but as it grows, leaves from bottom show the problem. What can I do? It is located near south window. Get rid of the disease area and clean the pot and re-pot with clean soil. Trim some of the roots too,they might be infected. I’ve had a jade tree for about 4 years. I let it get neglected, then when I started paying attention to it again, and put it in a kitchen window with constant indirect light it FLOURISHED. I then moved, and set it outside, again in indirect light, still in a pot. I live in Phoenix, Arizona so it is hot, and usually dry. It was OK for a couple of weeks, but now it suddenly started dropping a LOT of leaves!! I just now brought it inside again to a kitchen window once more. Did I water it too much?? Or what? I had been fertilizing it with almost every watering during the time when it seemed to be doing the best, then fertilizing it much less the last month or so. I’d be grateful for any help you could give me. The problem is the jade plant was moved from hot to another hotter area and then back to another temperature zone. She is undergoing lots of stress now-to much climatic changes. Temperature shock. Jade plant like people do not like the drastic change in temperature or humidity. My jade plant is on the same spot for the last 26 yrs and all I do is just rotate the pot so different areas get the sunlight. to the leaves and it will burn. Hi Chris – Thanks so much for your note. I’m not sure of its age. I bought it about 7 years ago and it was about half that size. Is it possible to trim back on the great big trunk ends, in addition to taking out the smaller ones a couple every 4 months? I put it outside in the summer where it just gets a tiny bit of sun in the morning, but I bring it in in the winter where it is in a western window. I don’t have any windows on the south. You want to put the jade indoor now because the temperature changes at nite. Do not want to put the jade in direct sun, it will burn the leaves and when that happens, it will have diseases. The first flowering on my jade plant was when she was 21yrs old.. There is a trick to MAKE the jade plant flowers every year around Christmas time but will tell later. Will post about it in November. I would love to hear from you whether you know of anyone interested or not. If I don’t sell it, I will repot it and bring it in again for winter. Also, if none of this works out, when I come up your way, I would love to see your jades. BTW, do you get them all to flower? Perhaps I would want to keep mine if I could get it to flower. It hasn’t happened yet. I have seen many jade plants and all of them are so bushy. You can cut the small trunks and put them in a new pot and give them as present. Cut 1-2 of them every 4mths to avoid stress. How old is the plant? I was reading an article uou had on the internet about the Jade plants you have. I also am growing 2 Jade plants and 3 aloe plants. I have to keep them on a table at work because of not any good windows at home. I was wondering if I was to bring them home, would they last very long just with the heat in the mobile home I have or would I have to get something like those lights that are sometimes used for African Violets? I’d like to be able to have them home to be able to take care of them and enjoy them home. If I could afford one, I was thinking of a small greenhouse with heating in it for the deck. It is screened in. This way, I’d be able to take care of them better than have them in back of the Mobile home in the winter months. What is your suggestion? I’d reaaly appreciate one. My name is Michele. Do you have windows at home facing the sun? That is the good location for it. Thank you for all the jade plant information that is posted on your website! I wanted to get your quick opinion on our jade plant(s). I purchased this about 18 months ago in the same pot with same soil as it is in now. As you can see, there are several separate plants and as you can see in the picture, they are getting too tall and skinny and are becoming unable to support themselves. Would it be best for me to repot these separately or in smaller groups? Should I cut them down shorter to encourage thickening of the base? If so, where do I make the cut? We would love to have the bases be thicker and more tree-like, like yours, but I am not sure exactly how to do this. I am originally from Washington state, but we are currently living in Dallas where it is HOT and sunny most of the time, so I have been keeping the plant inside, by the window where it get light. Not sure where else to put it. Any tips, ideas, guidance you have would be very appreciated! Your jade plant is beautiful! I would love to have this one around with us for a long time, but as you can see, I need some help. Hopefully it’s not too late! Thanks for the photo, it helps alot for me to diagnose and troubleshoot and give you a better guidance /consultation.Photos do not lie. Yes, you want to cut the skinny ones or the outer trunks as low as the soil and put those in other pots. Give them to your friends. Repot with new clean soil and new pots. Put the plants indoor …no direct sun as it will burn the leaves. Just say a prayer or 2 and give them TLC. Thank you so much for your time and Jade plant wisdom! I am a little confused, so just want to clarify. There are 5 different trunks. So, repot them separately, right? Do you mean cut each one off at the trunk at soil level (discard the roots) and replant? They don’t need their roots? Should I shorten them? Sorry, I don’t have a green thumb like you, but hopefully my good karma will shine through and these little guys will thrive! 🙂 I have new pots and new clean soil for them. I will definitely keep them inside. and insert the cut jade plant into the soil, the roots will grow from there. Right now I just water once every 2 weeks and for small plants, just 1/4 cup of water should be sufficient. Good time to change the soil. Yes, if the soil is too wet, the roots will rot. That’s a hell of a huge jade plant, Good job fella! I always say, it is better to show what I can do to my darling jade plant than talk about it.